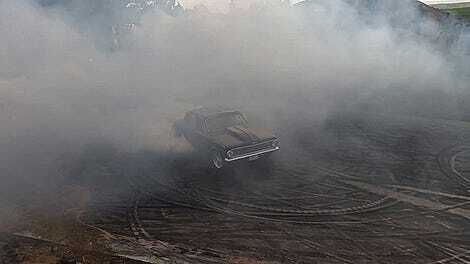 Burnouts rule: fact. 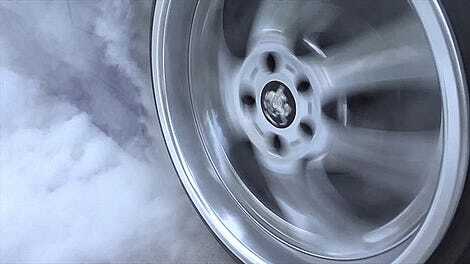 Take solid items—tires—and turn them into smoke through the joy of spinning wheels and friction. 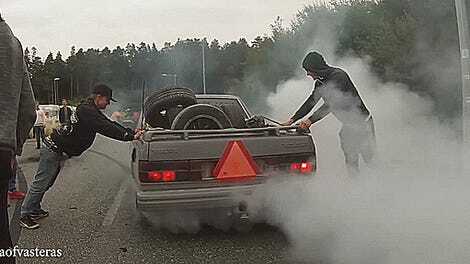 Add an anti-lag system to the mix and burnouts turn to fiery, popping madness. Let’s savor this gorgeous Toyota Supra showing off at an event at New Jersey’s Old Bridge Township Raceway. Anti-lag systems exist to significantly reduce turbo lag and give a turbocharged car more power when you want it. The fuel and air in the exhaust to make such a system work tend to ignite in spectacular fashion out the back of the car, creating all those exhaust pops and fireballs we know and love from Group B rally cars. The end result of all that power coming on sooner: this entire Supra driven by Rob Koloski of KB_Motorsports gets lost in its own tire smoke. Also, I’m pretty sure one of those iPhones on selfie sticks could easily get roasted like a marshmallow if their holders aren’t careful. You know the guy in the cow suit has to be impressed. I, for one, could listen to the unhinged popping, otherworldly turbo spool and sonorous roar coming out of this Supra’s tailpipe all day long.